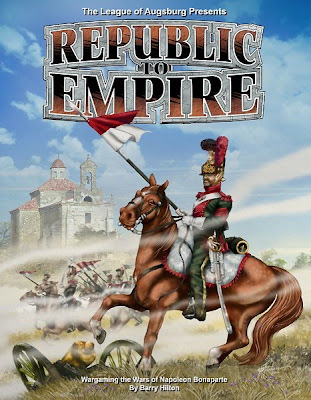 As detailed in my last post, I have been trying to learn the Republic to Empire Rules from the League of Augsburg wargaming group. They look quite interesting, much more detailed than previous rulesets I have explored. Well I believe I am off the ground now with the the help of Clarence Harrison from Quindia Studios, who played a large part in the production of the ruleset. The basic scenario is from Clarence's blog. It is quite simple with a brigade aside. Clarence wrote it as a French versus Spanish scenario, I have no Spanish though so I substituted Portuguese. 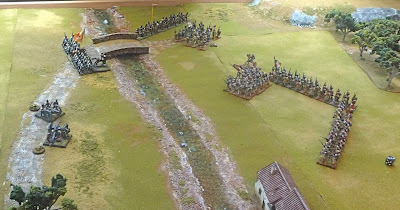 Essentially the French have to attack and hold the bridge at Piedre. They have 4 infantry battalions; 2 (1/2 26e ligne) with 34 figures each and 2 (1/2 66e ligne) with 32 figures each. 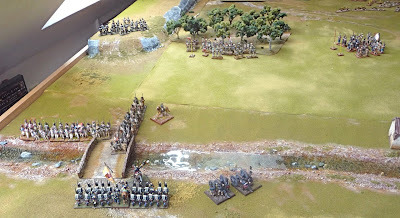 The bridge is defended by 2 Portuguese infantry battalions; the 21st line and the 3rd Caçadores both with 24 figures. The also have a 1/2 Foot Artillery battery of 8pdrs (2 guns). Other details of the scenario can be found on the link to Clarence's blog. The terrain is 5x5' in size and the French start just off the table, they enter in 4 columns of companies. They have MOVE orders. The Portuguese brigader has the 21st in line ready to defend the bridge, the Caçadores are in column of companies and the FA is unlimbered defending the approach to the bridge. They have DEFEND orders. Please note the demarcated area of exclusion around the artillery. The French gain the initiative and throw 1 DAV and get a 4, thus 4 Maneuver Points (MP). They advance in Bde order up to 14" at zero MP cost. You will note that the 2 battalions of the 66e form a long column, while the 2 battalions of the 26e remain abreast of each other. The 1/26e that use the MP to advance another 14" (1 MP) to bring them to the north shore of the river, they then form into line (1MPx2). The 2/66e use the remaining 1MP to advance abreast of the 1/66e. The rest of the French phase now takes place, there are no charge reactions as the 1/26e are more than 3" away from the Portuguese FA. 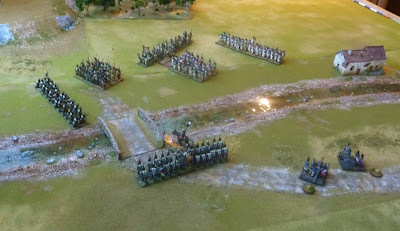 The 1/26e are now in their fire phase, they have 34 figures so they 9 Combat Groups (=# of D6). They have no positive modifiers, but several negative modifiers (target deployed artillery, movement penalty and are in effective range). These 3 negative modifiers sequentially reduce the original 9xD6 (50% each time) to 1.2 D6, rounded up to 2xD6. The French throw a 5 and 6 (where is La Colonel Tiff now!!). The Portuguese FA suffers 2 casualties (anything 4 or over) and reduce their 8 figures to 6. No further steps are required in the French phase. Stay tuned for the Portuguese phase of Turn 1. The Portuguese throw a 3 on 1xDAV: 3 MP. Their Bde Gen feels is position is not good and decides to get aggressive. 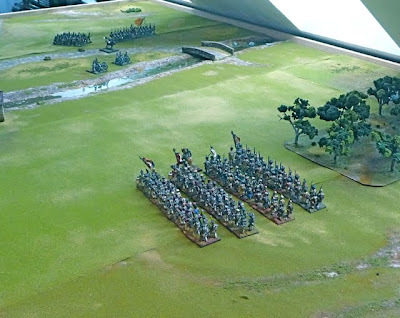 He moves both of his infantry battalions, the 21st line move within 3 inches of the bridgehead and the 3rd Caçadores 14" across the bridge at zero MP, he than uses his 1st MP to move the 3rd a further 14" and than maneuvers them into line to face the oncoming French (2x1MP). The Bde General moves to stay within 9" of his 3 units. He looks a little precarious there. I am going to stop here for the day as I want Clarence to have another look, I suspect the interpenetration of 21st was ok, but I am not sure if the maneuver of the 3rd was appropriate and also they are 12" away from the 1/26e, so they may be able to fire into their flank at extreme range. French Phase: Some tactical screws up here. The French again gain the initiative and throw a DAV for 4MP. Colonel d'Heroic decides to use his MP for single units actions with the plan to advance the 2/66e and charge the Caçadores, with the 2/26e in close support and the 1/66e kept in reserve. These 3 battalions all advance into position, with the 2/66e advancing within charge range (10") of the Caçadores at the cost of zero MP as they are still on MOVE orders. The 2/66e then use 1MP to FORM attack column with the intent to use 2MP to CHARGE on the charge step of their phase. (He actually can not do this as he is under MOVE orders which do not allow a charge) The 2/26e use 1 MP to also advance in column of companies to within charge range. Musket firing stage; the 1/26e again fire at the Portuguese FA to cause 2 more casualties. Getting tricky as the FA are now down to 2 crew per gun. The 2/66e then fire at the Caçadores they have 3 combat groups up front so throw 1xD6 (down 1 as they moved this turn, down 1 as in effective range), score 1 hit, the 2/26e fire as well they are in column of companies, and throw 1xD6 (minimum D6 rule) and they score a hit. Lucky dice!! After doing this I realise that the 2/66e CANNOT charge this turn as they have fired (and are on MOVE orders) , so d'Heroic has to change his plan and use 2MP to form the 2/26e into column of attack. Looks a little tricky for the Caçadores facing down 2 French attack columns. 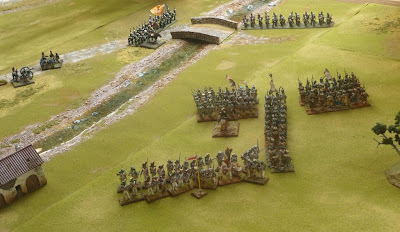 Portuguese Phase: Colonel Montoya throw the DAV and get 3 MP. There is no move that he sees as value, his troops are as well positioned as they can be. He did consider limbering his cannon and moving back out of range of the 1/26e , but the rules say that manhandling guns require full crews, which he does not have. (Wrong again, misinterpretation of the terms manhandle and limber; they can limber at the cost of 1MP, but can not move unlimbered once any crew are lost, they can still change face) The cannon fire at the 1/26e, they have 6xD6 as they are point blank; score 3 hits, they rapid fire (optional rule) again and score 2 more hits, the 1/26e have now suffered >25% casualties, but the FA have only 1 barrage left before they have to refit! The Caçadores now fire their rifles at the 2/66e, they have 6 CG, so 6D6 + 2 extra for dense fire ( they have no negative modifiers aside from 50% reduction for effective fire), they throw 4xD6 and score 2 casualties. It also seems that the 21st line can fire at the flank of the 2/26e at extreme range they throw 2xD6 but miss. Lot of fun so far. By the way, you can find expert analysis by Clarence Harrison and others at La Bricole. La colonel Tiff is tut-tutting my inability to rapidly grasp the rules, and especially laughs at the D3 debacle! Adjusted start position at the start of Turn 3. The Portuguese finally win the initiative and have 4MP's, there is nothing however the commander can see to adjust he maintains his DEFEND command. In the the artillery phase the FA cause 2 further hits on the 1/26e. The Caçadores fire as well at extreme range 2xD6 and have 2x4's; 2 more hits. (Probably should have fired at the 2/66e or 2/26e) The 1/26e have now had 13 casualties. The Portuguese FA have now fired 4 times and are due for a REFIT. The 1/26e check RESOLVE, they are up 1 for support but down 2 for 26-50% casualties, they throw a 2, modified to a 1, they turn back and retreat 14" (D6 throw & 8). The French gain 4 MP, they change their orders from MOVE to ATTACK (3MP). They use their remaining 1 MP to RALLY the 1/26e. They throw a 5 (modified up 1 for support and modified down 2x2 for RETREAT status and 26-50% casualties)=2; change to WAVER status. They have run out of MP's so they cannot initiate charge. (do I move now or wait until next move?-Answer was next turn). The 2/66e and the 2/26e both shoot at the Caçadores at extreme range; no modifiers aside from extreme range throw 1xD6 each, the Caçadores take 1 hit. Position at the end of Turn 3. I have asked some more questions at La Bricole. Clarence has very kindly provided this diagramme to illustrate how I should have retreated the 1/26e. As you can see they should have gone straight back and he very clearly illustrates the arrangement of the bases to represent the 2 disordered battalions. Well aside from the tactical mistakes, it appears that I got through Turn 3 without any significant errors. Here is a snap of the position at the start of Turn 4, the 1/26e are both disordered and in a WAVER state. I took Clarence's advice and skewed the bases to represent disorder, the yellow flag pole represents the WAVER state. You can also see that the Portguese FA have moved back and are undergoing refit. They threw a 2 on a D3, so are out 2 turns. A discussion of REFIT can be found on the League of Augsberg site. So the French again gain the initiative. They throw the Dav and get 3 MP. The first MP goes to use a single unit FORM command on the 1/26e, they turn around and reorder their ranks, they are still under a WAVER condition as this is not removed until the opposing players phase in this turn. The other 2 MP's are of course are used for single unit CHARGE commands for the 2/26e and 2/66e. 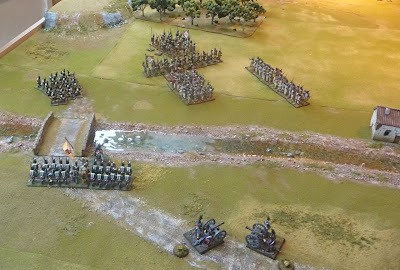 Colonel d'Heroic also moves to support his charging infantry, unfortunately moving out of command range of the 1/26e. (I really should of moved the 1/66e forward as well as the French need the Bde support of 2 units once the attacking units move forward) The 2/26e take a RESOLVE check to initiate charge, their modified D6 is up 1 for support, but they throw a modified 3 so refuse to charge. The 2/66e take the same test and get a modified 4 and CHARGE! The 3rd Caçadores take their RESOLVE check to see if they stand. They throw a modified 3 (up 1 for Bde support) and WAVER and become disordered. They still can take a Stand and Fire test, get a 4 so the 2/66e move up to effective range (3"), the Caçadores fire they cause 2 casualties. The 21 line also fire as Bde Support (they were suppose to take a resolve check as they were in support of a charging unit, but I failed to to do this as I am not sure I agree) and miss. As the 2/66e has taken casualties they have to take a further RESOLVE test to charge to close, unfortunately because of the failure to advance the 2/26e and 1/66e in the movement step, they have no support, they throw a modified 2 and WAVER and become disordered, no close combat this turn. (I am still a little confused whether any units should take further RESOLVE tests in step 13) You can see that both units are disordered and under WAVER. Now the Portuguese get 3 MP. Colonel Montoya uses 1 MP in a single unit FORM, to reorder the caçadores. Not much else to do, as they have already fired this turn. The 1/26e remove their WAVER status automatically in step 13. (Last paragraph page 99 middle column) The turn ends as shown. French gain the initiative, they get 2MP, 1 is used to FORM the 2/66e. The second MP is used to order the 2/26e to charge the caçadores. As the Bde is on ATTACK orders, moves have to take place. The 1/26e advance 4" in line (they are out of command range), the 1/66e advance to support the front line in CC and the d'Heroic moves to regain command over all 4 infantry units. 2/66e can not fire as they formed this phase. The 2/26e fire and miss. So the 2/66e are ordered to charge but they throw a modified 3, so refuse to charge. The caçadores remove their WAVER. The Portuguese get 5 MP, time to do something dramatic. Their artillery continue to refit. 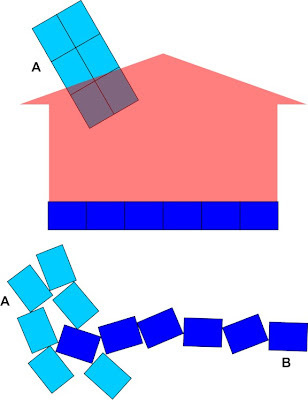 1 MP is used to FORM the caçadores into AC, and 2 MP are used to order them to CHARGE. They are on DEFEND orders so no movement is required. The 21st fire at the 2/66e with 1xD6 and cause a casualty. The caçadores pass their RESOLVE to charge, the 2/66e take a WAVER result in their RESOLVE test. The 2/26e Stand and Fire at effective range, they miss. The caçadores check to Charge Home, and pass their RESOLVE test. The 2/66e get a ROUT result and have to move 13". (the rules here are really a little much, they require alternate 25% movement, this is where the rulebook could have benefitted from some diagrammes) Anyway contact is not made, and the caçadores advance to the position of the 2/66e, but are now disordered. The way to the bridge is effectively now blocked by them. No fast advance by the 1/66e across the bridge now. Both the 1/66e and the 2/26e pass their RESOLVE checks for exposure to the routing 2/66e. Clarence has provided another diagramme here to illustrate the incremental pursuit rule, it is clear though that this mechanism is of little utility in infantry on infantry engagements, but is important of course in a cavalry on infantry pursuit. Here the blue infantry unit has a 14" move and the red unit has a 13" rout. Great diagramme! The Portuguese gain the initiative and get 4MP. One is used to FORM the caçadores and 2 MP is used to FORM them back into line. They can not charge this turn because they started disordered in this phase. They have 1MP in reserve. Their FA will return next turn, I suspect they are going to play a critical role. The French get 2MP, they use 1 to attempt to RALLY the routing 2/66e, they are unsuccessful, and they rout another 11". The 1/26e advance in line. No firing takes place as the 2/26e want to charge this turn. The 2/26e declare their charge and they pass their RESOLVE test. The caçadores take their RESOLVE test and get a WAVER result. They Stand and Fire at point blank range and throw 2xD6, 2 casualties. The 21st throw 1xD6 and get a 6, 1 more casualty. The Portuguese seem to be getting great dice. The 2/26e pass their RESOLVE test to Charge home. The caçadores take their Fight or Flight test.........and they ROUT! !.........right off the table. The 21st remain STEADY in face of this setback. Stay tuned, the end is near! The rules are definitely starting to gel for me now, there is a steep learning curve, but once the rules are understood it does take very little time to play a turn. Well let's get back to the game. I should reiterate some of the scenario rules. 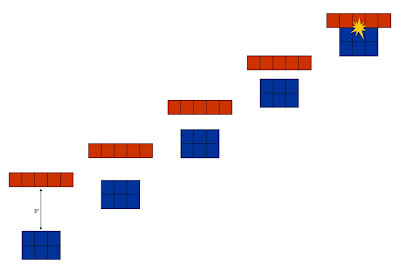 The bridge only allows a single base width formation to pass, this means either a column of march or a column of companies. To win d'Heroic has to have 2 battalions which are steady with less than a 50% casualty rate. The game is also over at Turn 9 (simulating nightfall), it can be extended 3 turns with a successful die throw each extra turn. 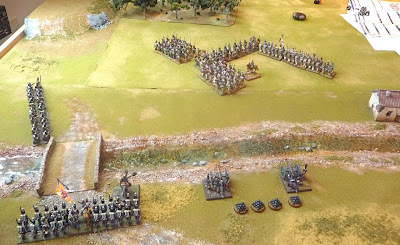 Remember that the game does not allow a charge in either of the above formations, so at this point the only tactic that the French have is to fire at the 21st Line in the hope that they will weaken and retreat or rout. The French gain the initiative and get 3MP. If you look at the above photo you see that the 2/26e are disordered, so d'Heroic uses 1 MP to FORM the battalion and then uses 2MP to FORM the same unit into line (this was an error as you can only use 1 FORM per turn, c'est la vie!!). 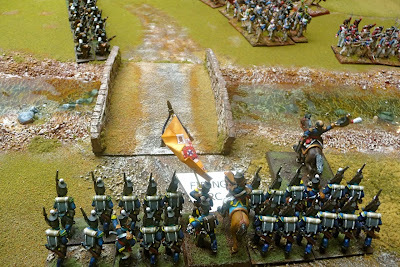 The French commander moves his troops to start the final assault on the bridge as he is running out of time. The 2/26e wheel into position along the river's edge as do the 1/26e. The 1/66e advance in column of companies onto the bridge. The 2/66e continue their ROUT move and move off the table. 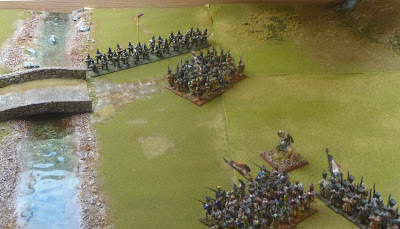 The 21st Portuguese line are going to stand, they are not interesting in a charge threat reaction maneuver. 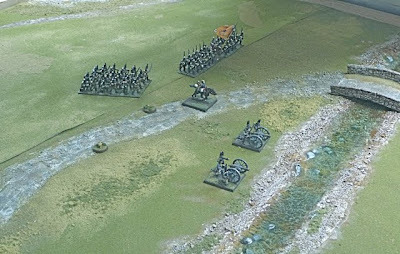 The 3 French units fire, the quality diminished by the fact that they moved this turn and they are only at effective range. They score 4 casualties on the 21st. The Portuguese now have a chance to respond, the Foot Artillery has now under gone refit and is ready to fire. They have no use for their 3MP. The artillery fire at the 1/26e, 3 more casualties to this already weakened unit. The 21st fire at the oncoming 1/66e and only cause 1 casualty although it is dense fire. 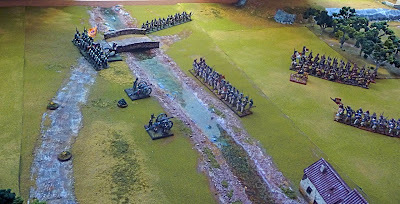 As the 1/26e have taken artillery casualties and now have greater than a 50% casualty rate they test RESOLVE and ROUT. The 2/26e and 1/66e both have to now test their RESOLVE as they have had a unit rout in their sight and they both remain STEADY. The Portuguese gain the initiative with 5MP. There artillery are not well positioned, they can not manhandle as they are down crew members, so Colonel Montoya decides to use his MP to limber and move and then 2MP to unlimber and fire. ( I see no rule against this in the book) The artillery crews bring the cannon forward and wheel them to the left so they can provide enfilade fire to the 1/66e. Their fire is reduced this turn as they have moved and they miss. The 21st fire and score 2 more casualties on the 1/66e. The French gain the initiative and they need it. All they can now do is fire and hope the 21st line break. Both units fire but cause only a total of 2 casualties. It is not going to be enough. The 21st check their RESOLVE and true to their nature they remain STEADY. 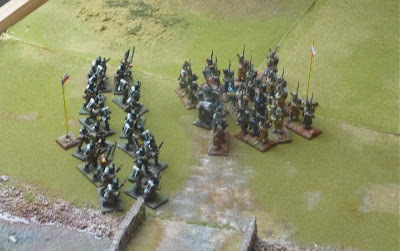 The Portuguese now unload their cannon and muskets. Their combined fire cause 9 casualties! The 1/66e test their RESOLVE and WAVER and become disordered. It is getting dark, I believe they may have failed in their mission to secure the Bridge over the River Piedra. The D6 is thrown, a 2 is obtained: Game over. This was a lot of work (the AAR I mean) and the learning curve for the rules was steep. I believe the writing in the rulebook lacks clarity at times. Some diagrammatic help would have gone a long way, as Clarence has subsequently provided. 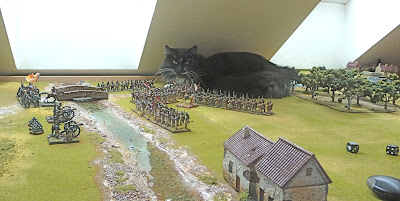 I am a new wargamer, so I do not have the experience of years of playing wargames to help me decipher mechanisms that may be obvious to others. I do believe some of the mechanisms may be over detailed, but I am no expert. Notwithstanding the above, my next game will use these rules. I like the big battalions and am looking forward to using skirmishers in a real sense. The game does flow very quickly once you understand the rules, this scenario could have easily been played in under 2 hours solo. The rulebook itself is beautiful. Beautiful view. I like the battle with many many figures! The big battalions are nice. Excellent set-up. Waiting for the next turns. A question: It looks very strange to me, the use of a French Line batallion to mask a Portuguese battery, isn't it? Yes it is bizarre, but it does appear to be working for the French. great looking battle and an excellent blow by blow account, looking forward to the next part. Made for an enjoyable read through, nicely written (and great pics of course!). 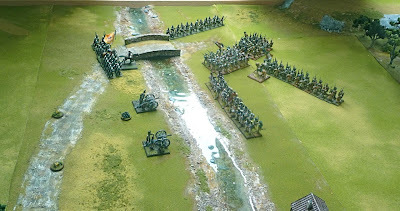 With those big battalions I would like to see French skirmisher screens deployed, particularly along the bank facing the artillery (was this the point you were making Rafa?). Do the rules accommodate this? I'm out of touch with 'modern' rule sets, still being a WRG fan, but there are some nice ideas in there. Looking forward to the next moves. There are 5 pages of skirmisher specific rules, I am trying to keep it simple. No cavalry, terrain, BUA etc in my first game. I only started wargaming in the last year or 2 and the games I have played so far are relatively simple (FoB and Lasalle), this is a much more complex game. I am enjoying it though. Hopefully I will get the Turn 3 in today. Love your walk through John Michael. Really nice table and figures too. Playing solo will of course take a little longer but I hope you get the feel for R2E via Clarence's introductory scenario. Blog's of this type with no doubt get people thinking about R2E in a realistic and gameable context.. that is how I wrote it. I am a gamer and not an academic/historian. I like to worship the dice Gods like everyone else!!! Thanks Barry, I am enjoying the game. I believe after the next turn or 2 the rules will gel for me. Clarence has been a great help through the La Bricole forum. I am already thinking of my next scenario. Apologies if I came across as being critical in any way in my earlier comments, I do understand how demanding it can be to learn A new set of rules. The notated scenario is a great idea and will help others, myself included, to get a feel for the mechanics of the game. .....and meant to add, love the shot with the cat :-) that's just so typical of them isn't it! Thanks Lee, absolutely no slight was perceived. Thanks for the detailed account John - like Miles I've just tried Black Powder but it appears better for later periods (works really well for ACW) so was interested to see how RtoE went. Its good to see such a comprehensive write-up from someone who is a first-timer with the rules. Its important to see what mistakes can be made and what solutions the rules offer to simple tactical manoeuvrings. I concur with Lee's comment about skirmishers. No criticism intended but it is an integral part of French tactics and the use of columns in attack. 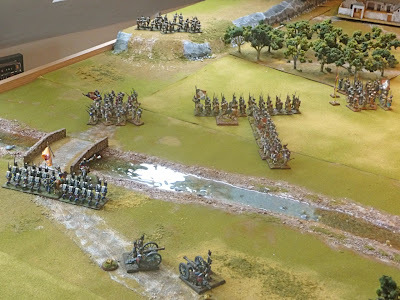 It works for both sides too - the cacadores rifles can deploy outside French musket range and (hopefully) inflict enough casualties to force a French unit to test and possibly disrupt its attempt to attack. The main thing is of course that you are enjoying it. Beautiful table, figures and cat! You must be prescient Doc, as that is what has happened I just have not had a chance to write it up. Thanks for the write up John. I'm guessing that it was quite a bit of work! You've made me happy with your final thoughts as well. I'm hoping for, and anticipating, good things from Republic To Empire and you have given me more cause for hope. Thanks von Peter, I shall be waiting your first playtest. Fascinating post - I really like how you took the time to show the iterations of your learning process. I also liked seeing Clarences support. While the rules seem a bit complex, I'll give them a go. Writing rules are a surreal experience. While I didn't actually design the game, I had lots of input and I was able to learn things as we went along. I did my best to make sure the rules were understandable, but I've been playing wargames for more than twenty years, so concepts that were self explanatory to me may not be clear to beginners. I know Barry relied a lot on me to make sure things were understood. We did make an effort to include lots of examples, but it's clear now that more diagrams would have helped. At least with the internet, you have a chance to ask us questions and I will ALWAYS help out if I can! The rules really do flow fast and after getting the command rules, I think the rest of the mechanics will be straight forward. I look forward to future battle reports! Many thanks Clarence for sticking with the game, it was much appreciated. I believe I am less of a beginner than I was! !